For us, half-term holidays aren’t just about escaping our everyday routine, they’re also about going somewhere different and discovering something new. Being long-time holiday park fans, we’ve been to many of the UK’s main hotspots but this year we decided to break out of our old habits and go somewhere original. That’s why this year, we’re setting our sights on Lincolnshire. With October half-term only lasting a week or so, we usually go away for about four or five days at half-term. That’s just long enough to fit in loads of great activities and feel well rested, while leaving enough time either side to pack and settle back in at home before school starts again. The holiday season isn’t over in October but with autumn in full swing, chances are the half-term holiday could be hit by the odd rain shower. That’s why we usually book a half-term holiday at Haven to guarantee there’ll be things to do just in case it’s a bit drizzly outside. Each holiday park has indoor heated pools, sports activities and sometimes even a spa so whatever the weather there’s always something to do. 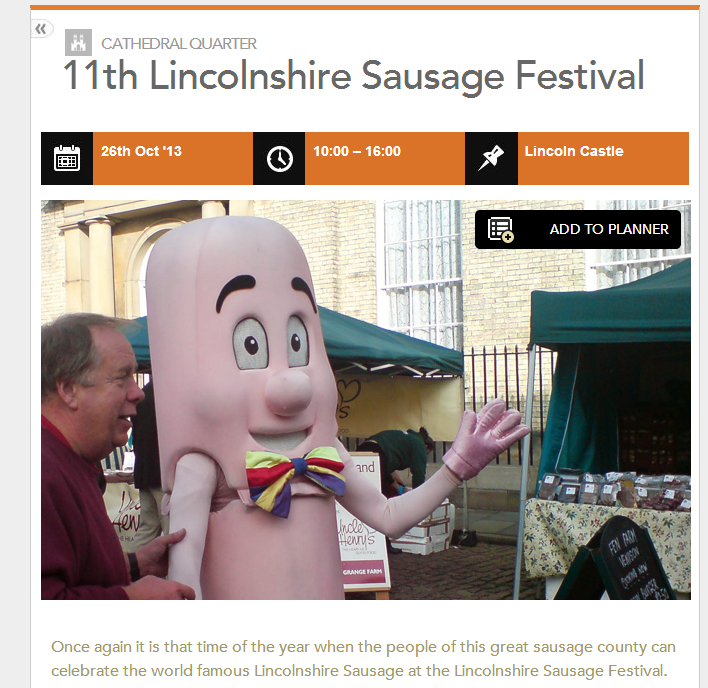 But what made us decide to go to Lincolnshire this year? The great events that will be taking place throughout the autumn were a major attraction as it means there’ll be plenty going on when we decide to explore the local area. And with not long to go until October, we decided to book our October half-term holidays early to avoid missing out. The Lincolnshire sausage is one of Lincolnshire’s most famous exports and there’s nowhere better to try it than at the Lincolnshire Sausage Festival. I love quirky, one-of-a-kind events and this sounds like it’ll be just that. It’s taking place on 26th October at Lincoln Castle and Castle Hill – slap bang in the middle of October half-term. It’ll be the eleventh time the festival has taken place and last year more than 11,000 visitors turned up to celebrate this world-famous sausage. We’re particularly looking forward to watching a sausage-making demonstration and, of course, eating a few too. There’ll also be music and entertainment throughout the day and something for the kids who can take part in a children’s cookery demonstration and meet the festival’s special guest, Mr Sausage. Visitlincoln.com has a whole page dedicated to the festival so you can find out all you need to go before you get there, including what’s on and how to get there. And you know what the best thing about it is? Entry is completely free. We can’t wait to spend a day at the Lincolnshire Sausage Festival. Lincolnshire seems to have great events for foodies all year round and heading over there in September will get you there just in time for the Lincolnshire Food Festival. It’s taking place on Saturday 21st and Sunday 22nd September and like at the Sausage Festival, there’ll be plenty for the whole family to get stuck into. Not only will there be loads of delicious foods to sample from Lincolnshire and around the world, there’ll also be a whole host of celebrity chefs running cooking demonstrations. And if you’re bringing your kids along, this event will cater for them too. The ‘Kidz Korner’ will have plenty of events running where your kids can learn how to cook healthy food and have fun in the kitchen. There’s also going to be face painting and arts and crafts so there’s no way they’ll get bored. Kids even get in for free! Will you be going away this October half-term? The sausage festival sounds like a great idea! Don't suppose there's a pork pie festival as well? We won't be going anywhere this half term as we have a new baby due shortly after so this Mummy will be doing a lot of resting I think! We went to Lancaster last month, I wish they'd have had a sausage festival, my son would have had a field trip, he loves sausages! Sausages and festivals - a perfect combination! Love the sausage costume pic too!